This house is the construction of a luminous shadow. A minimalist white box; architecture reduced to its bare bones; we absolutely love it! This ultra modern minimalist house is perfectly balanced and full of light and contrasting shades. The house features 26' (8 meters) tall walls around a rectangle. 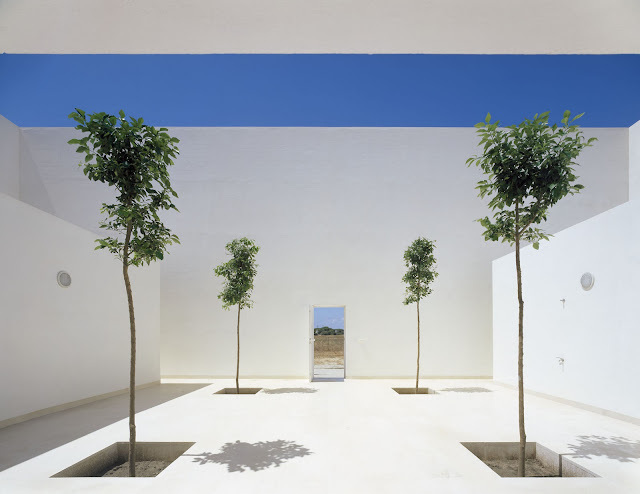 To fill this central space with shade, the architect opened it to the front and back, creating 10' (3 meters) deep porches that protect these openings from the sun, tempering the light. In the front courtyard, the entrance to the house, four citrus trees mark the central and main axis, flanked by low walls that hide service areas. In the back courtyard are an additional four orange trees which are similarly aligned. And at the end, carved into the ground, a minimal low pond stretches from side to side. A fine example of ultra modern minimal architecture, created by architect Alberto Campo Baeza. 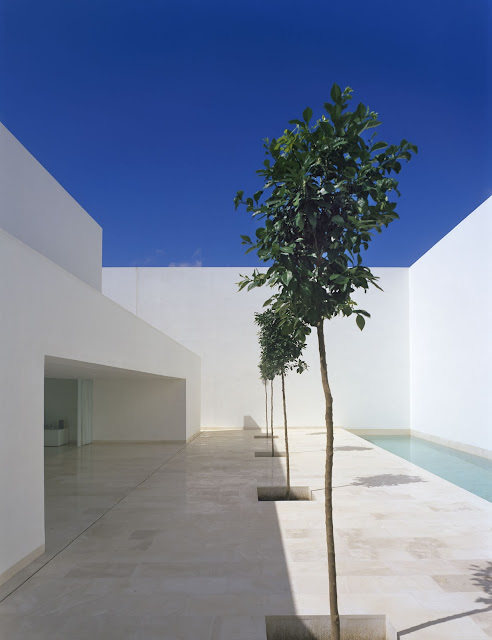 It is located in Vejer, Cadiz, Spain. Award-winning Spanish architect, instructor, and writer Alberto Campo Baeza showcases the edifices upon which he has built a reputation as one of the major talents in European design. 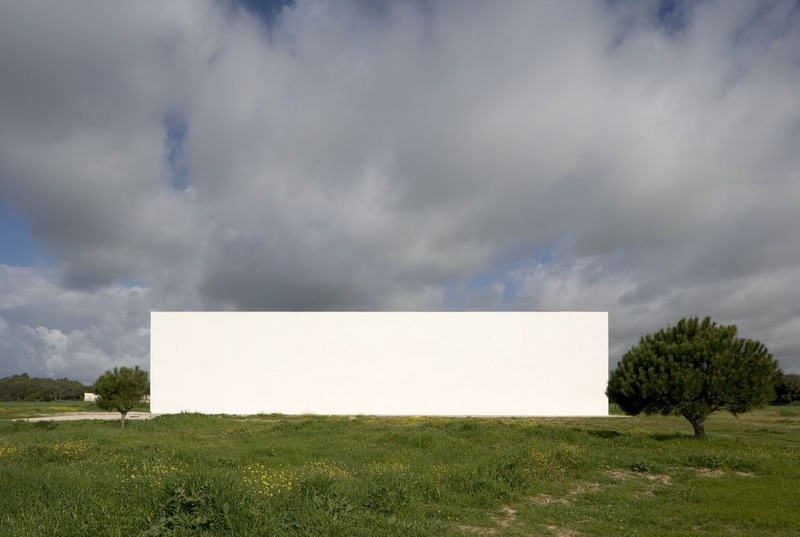 Covering a range of projects that include houses, schools, governmental, and corporate buildings, Contemporary World Architects: Alberto Campo Baeza shows how his trademark work with "architectural boxes" puts Alberto Campo Baeza among the avant-garde. 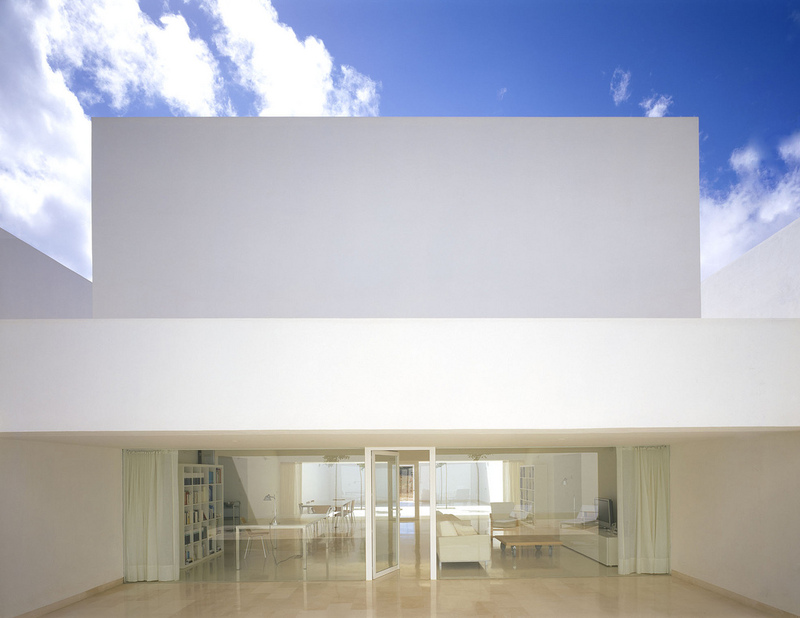 Many of the ideas so precisely distilled by the architect Alberto Campo Baeza are carefully kept in boxes. As the great Russian architect Berthold Lubetkin said at the end of his life, he only made "cement shoeboxes." At times, Campo Baeza does that. 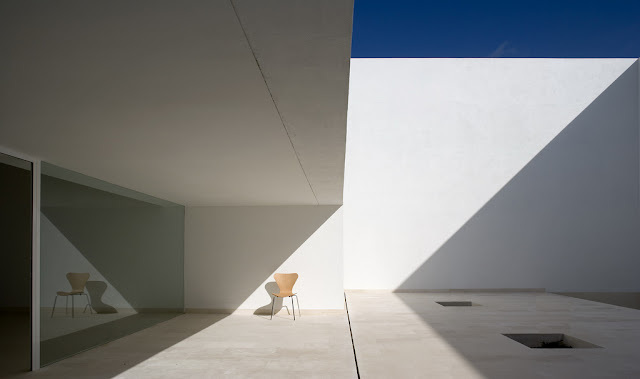 In this book, Turegano house is a white, cubical box; the house in Valdemoro oblong; Caja General in Granada is a large box in golden concrete transfixed by light, the same light that pierces all of his tensed architectural boxes with a thousand different shades like the "boite a miracles" of Le Corbusier. With beautiful color images, Contemporary World Architects: Alberto Campo Baeza will awe and inspire professionals in the field, and anyone who loves and appreciates strong design.